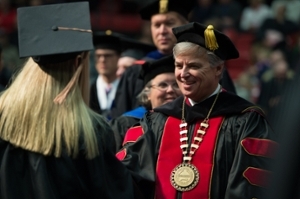 Southern Illinois University Edwardsville Chancellor Randy Pembrook will oversee the 2017 Spring Commencement exercises tonight and tomorrow for 1,957 eligible graduates. The first of four exercises will begin at 6:30 p.m. tonight in the Vadalabene Center on campus. All the ceremonies will be streamed live on siue.edu/tv. Frankie Muse Freeman will be awarded an Honorary Doctor of Humane Letters. Freeman has spent her lengthy career advocating for civil rights issues that have had a lasting impact at the local, regional and national levels. In 2007, Freeman was inducted into the International Civil Rights Walk of Fame for her leadership role in the civil rights movement. In 2011, she received the National NAACP’s highest honor, the Spingarn Medal for outstanding achievement by an African American. SIUE emeritus professor and former administrator Johnetta Randolph Haley and renowned architect Gyo Obata are being honored with the University’s Distinguished Service Award. Haley became a member of the SIUE faculty in 1972 as an assistant professor in the Department of Music in the School of Fine Arts and Communications. She rose through the SIUE ranks to associate professor in 1978 and to professor in 1984. She was appointed acting director of the SIUE East St. Louis Center in 1982, and she became the director in 1984. She was named professor emeritus in 1993 by the SIUE Music Department upon her retirement. In 1994 shortly after Haley’s retirement, SIUE’s minority scholarship program was named the Johnetta Haley Scholars Academy in honor of her many contributions to the University and to the East St. Louis community. In 1955, Obata co-founded Hellmuth, Obata + Kassabaum (HOK), the largest United States-based architecture/engineering firm. In the early 1960s, Obata was commissioned to design the new SIUE. He conceived the idea of a centralized campus, likened to a small college square, with all facilities located within a circle. The festivities begin tonight with Graduate School, School of Business and School of Nursing students receiving their degrees. Mia Thoen Frogner, who is earning a bachelor’s in business administration, is the student speaker for this evening’s session. Ceremonies resume tomorrow at 8:30 a.m. with the Graduate School and School of Education, Health and Human Behavior. The morning student speaker is Melissa Sue Beyer, who is receiving a master’s in psychology. The Saturday afternoon ceremony begins at 12:30 p.m. with the College of Arts and Sciences (CAS) followed at 5 p.m. by the School of Pharmacy, College of Arts and Science graduate students and the School of Engineering. The student speakers will be LaShaunda Lenora Jordan, who is earning a bachelor’s in mass communications, during the afternoon session, and Veronica Leigh Delgado, who is receiving a master’s in art therapy counseling, closing the day. Photo: SIUE Chancellor Randy Pembrook congratulates a graduate at the 2016 fall commencement ceremony.